Over the past few years, I’ve turned dabbling in DIY into a full fledged hobby and lifestyle. It feels like only yesterday that I was still living in West Hollywood, enjoying a full fledged “Ah-Ha!”-moment while figuring out what to do with my extraneous glassware, jars and jugs. I’d been scouring the internet, hoping onto Pinterest and not so secretly scrounging boards of friends and strangers alike. I’d seen some awesome tutorials and the like floating around a few of my favorite websites and decided to give them a try; voila – my obsession with candle crafting and creations was boldly curated. Between picking the perfect colors and aromatically inspiring scents, rummaging through old glassware to find the perfect fit, educating myself on chromeotherapy and using the new moon to fuel my creativity, I not just think, but know, that I’ve found my happy place. Now, when I look back and I take a gander at the vast oeuvre of DIY that I’ve partaken in, I’m slightly blown away. What began with an obsession with setting up sparkling mason jar candles, manifested into manufacturing the real thing and a revving up a full blown ETSY Candle Shop to spread the love of my crafts, repurposed jewelry and, of course, candles! In a sense, you could say I’m hooked. Conquering candle creation was one thing, but decorating and adorning the glass is quite the horse of a different color! Though I’ve never considered myself “artistic” in the “Paint me like you paint your French girls” manner, I definitely can get as artsy as the rest of ’em. After months of toiling and trying with oft combinations of glitter and glue to decorate the mason jars, the glitz and glamour more often than not washing away between uses, I’ve been searching for a way to switch it all up. For the record, I’ve finagled mosaic mirror tile on the outside with glitter and gems on the inside; plaid patterns, whimsical color swatches, you name it – I tried to DIY it. Needless to say, when I saw an simple home tutorial for color casting glassware – I was intrigued and quickly queried the inter-webs for all the necessary supplies. Mason jars evolve into exquisite candles, makeup brush holders and pencil keepers, former wine bottles transform into elegant vases and like night to day – what was once in your trash can become treasure, in mere minutes! Not only did it look awesome, but it seemed simple enough and wasn’t about to break the bank. Michaels‘ has some sporadic things, but – mostly, I’ve found it to be overpriced. You can search high and low for warehouse and discount websites, but suffice it to say – Amazon‘s got you covered. Assorted Upcycled and Recycled Glass Jars, Mason Jars, Old Spaghetti Jars, Jelly Jars, Wine Bottles….glass, basically. Food Coloring in Multiple Colors. remember the color wheel from Kindergarten? Awesome. We’re about to use it. Oven. We’re turning it into a faux-kiln! 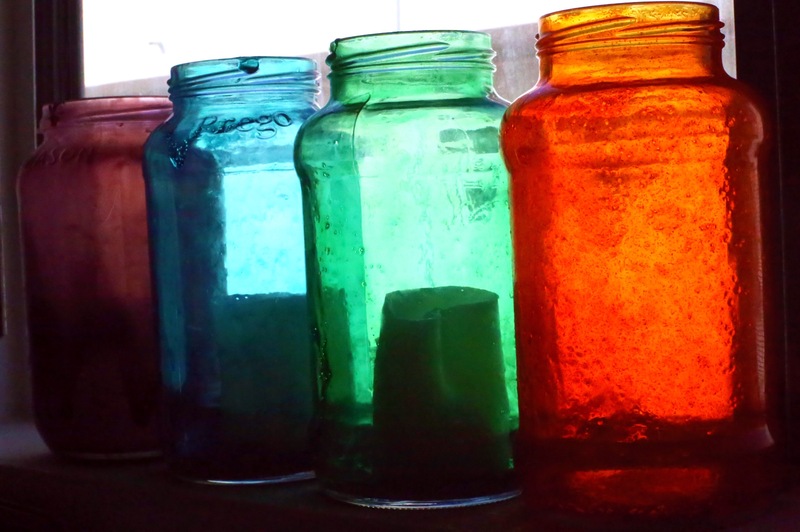 Take your colors one by one and pour them into each of your jars. Set up your baking sheet with aluminum foil or wax paper, whichever floats your boat; then line it with some paper towels. While the colors set in, let’s set the oven to preheat at 225° and make sure there’s enough height for all the glasses. After half an hour has passes, remove from paper towels and turn them right side up on piece of newspaper . Toss your paper towels away, if necessary – swap out your aluminum or wax paper; and now you’re ready for a science project! Turn those chromatically appealing pieces of glass right-side up and onto your baking sheet, put your baking sheet in the oven, sit back – and enjoy that entire bottle of wine you just whimsically poured out because you realized the wine bottle makes the cutest little vase. Yes, you; I see you. Leave glass in oven for 30 minutes. When your timer goes off, grab your office mitts (yes, they’re hot!) – set your baking sheet in an appropriate location and then take a gander at what you’ve created. It’s pretty effing neat. From vases to candles, vacation jars, coin collectors and memory keepsakes – whatever you choose to turn your tinted glassware into, make it with love and make it yourself!